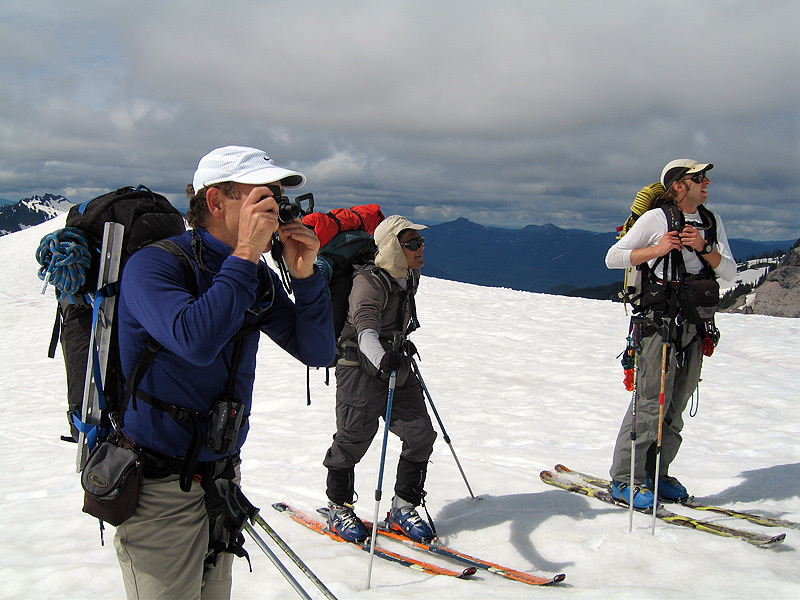 There was cause for consternation on the part of Glacier Class honcho Darryl Olson when fourteen instructors and only two students showed up at Paradise for the the class' climactic weekend field trip. 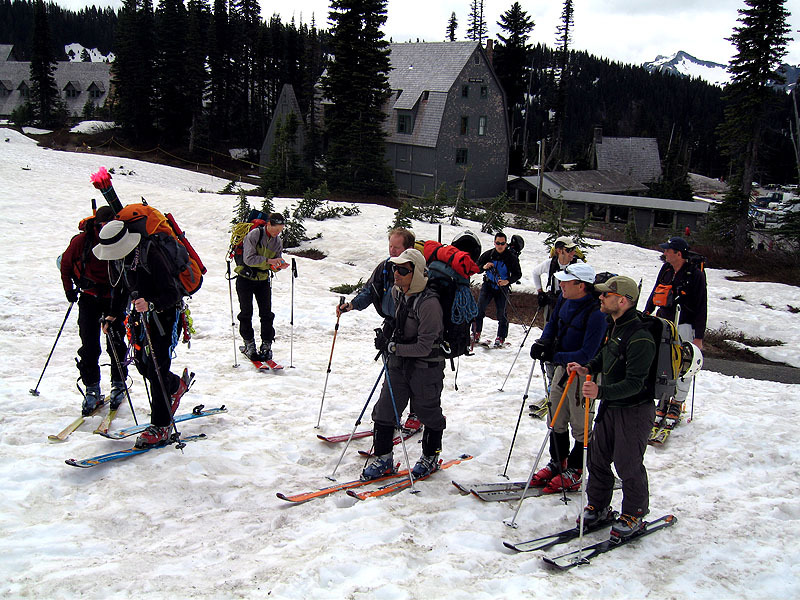 Darryl made a quick executive decision after a non-productive half-hour wait, and with a 70 percent chance of snow on the mountain the next day, called for condensing the two-day session into a Saturday-only intensive course. 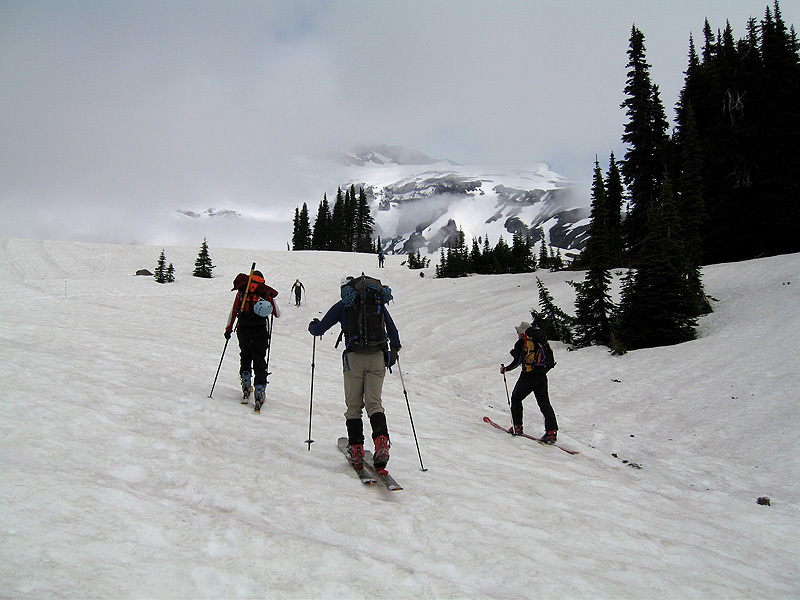 A few of the veteran instructors headed out to make some turns, while the bulk of the group began a leisurely skin up to Glacier Vista and the lower Nisqually Glacier. The high overcast was broken sporadically by patches of bright sun and attendant heat, but for the most part it was perfect "first layer" weather. 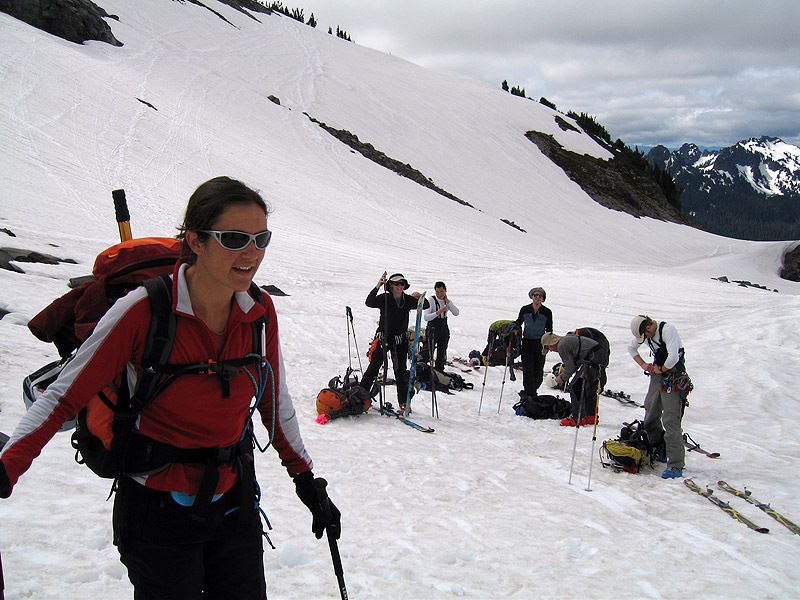 Our group passed a large contingent of climbers at the Nisqually moraine, and put even more distance between us and them once we were on skis. 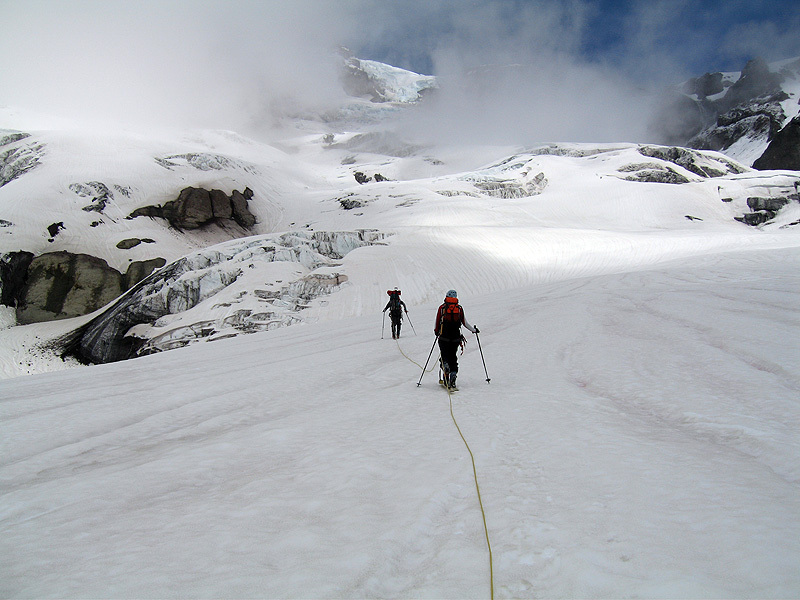 Due to the relative lateness of this year's field trip, we were able to find a perfect open crevasse at around 7,400 ft. and set up two rescue teams with backup "phantom" belay ropes. 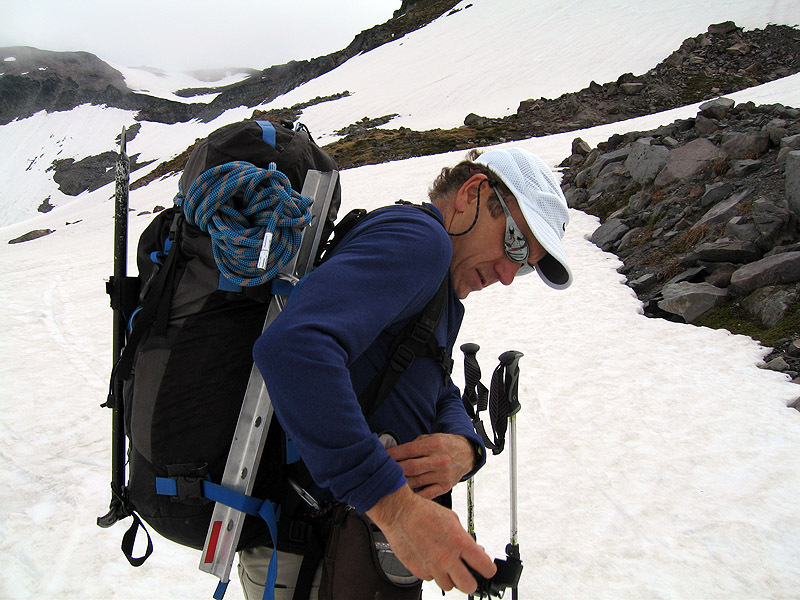 Once in position on the crevasse of our choosing, lead instructors Amar Andalkar and Skip Swenson went out on belay to check the solidity of the lip, and we set up shop in short order. With only one new student on each rope team, instructors filled in at the other positions, so everyone got a chance to review their skill set. Gear changes that had made some procedural changes necessary, like switching to short (35 meter) and narrow (9.1 mm) ropes, caused little problem. 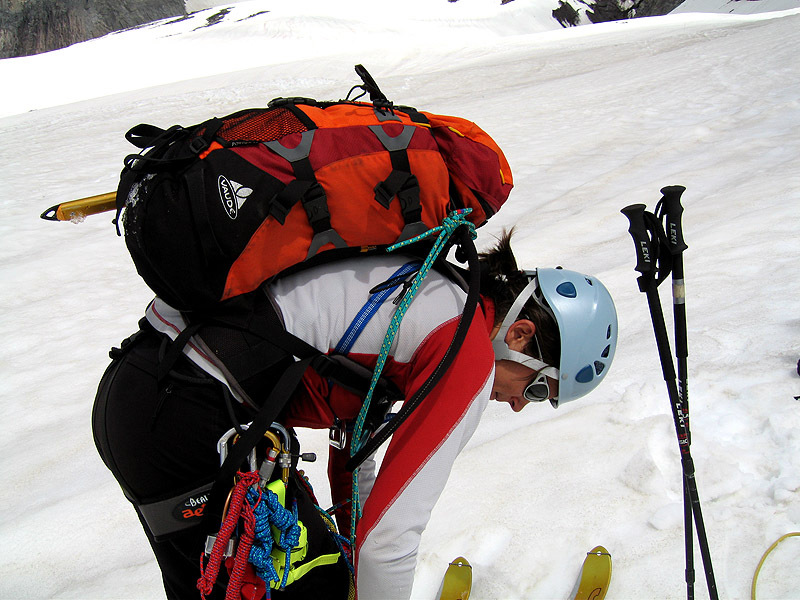 It seemed that there was plenty of rope to set up a Canadian Drop Loop ("Z" on a "C") system with the victim 20 feet or more into the crevasse. Just as we were finishing our last rotations around 4:00 PM, heavy fog started rolling in from higher up on the mountain and the temperature began to plummet. We dug up the anchors and beat it down the hill, where a group decision to make use of the already-paid-for campsite at Cougar Rock for an impromptu barbeque was made. The graduation ceremony was a little lackluster with only two students completing the course, but they were two "happy campers."